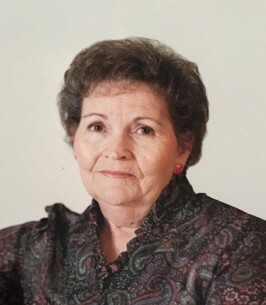 Leah Roberta Marshall Huff Jones passed away in St. George, Utah on October 17, 2018 at the age of 95. Leah was born on January 22, 1923 in Mohrland, Utah, to John W. Marshall and Martha Cox Marshall. She was the 14th of 15 children. All have preceded her in death. She was raised in Huntington, Utah where she attended North Emery High School. Leah married Charles Bernell Huff on May 27, 1941, Later, they were sealed in the Manti Temple on July 31, 1957. She had many gifts and talents. She was an expert seamstress. She loved to crochet and make her children clothes. She made so many beautiful things for her family. She also loved quilting; and teaching her children and grandchildren to love all these things as well. But mainly she was a very caring wife and mother to their five children. Leah was a devoted member of the Church of Jesus Christ of Latter-day Saints and was a true inspiration and example to her family of righteous living. Leah and Bernell lived in Price and Huntington, Utah, Livermore, California, and various other places as Bernell was an electrician for KieWitt Sons, IAC. Bernell passed away on May 24, 1978. Leah later married Jewell Jones. She and Jewell served a mission in the Louisiana Baton Rouge Mission. Jewell fell sick while serving and they had to come home. Jewell died shortly after. Leah then served another mission to the San Diego Family History Center. She also has served as Ward Relief Society President and in Primary and Young Women Presidencies. She is survived by her five children: Karen Truman (Stan, who is deceased) Santa Clara, Utah, JoAnn Arnold (Brent) Santa Clara, Utah, Linda Cowell (Dan) Ventura, California, Gary Huff, Santa Clara, Utah, Susan Davis (Scott) St George Utah. She is also survived by 16 grandchildren, 37 great grandchildren and 23 great-great grandchildren. She is preceded in death by her two husbands, Bernell Huff and Jewell Jones, her parents and 14 siblings. Funeral services will be Monday, October 22, 2018 at 11:00 AM in the Huntington Stake Center. A viewing will be held on Sunday, October 21, 2018 from 6:00 – 8:00 PM at the Heritage Funeral Home on 620 No Main St. in Huntington, Utah 6:00 - 8:00 PM. On Monday, October 22, beginning at 9:30 AM, prior to the funeral. Interment will be in the Huntington Cemetery. Services are in the care of Fausett Mortuary. Leah’s family would like to express their sincere gratitude for the love and care she received from the owners and staff of Platinum Care Assisted Living. We know she will be missed by all who knew and cared for her. She was known for quick wit and her playful attitude. We would like to thank Zion’s Way Home Health and Hospice for their love and their kind and gentle care of our mother. Friends and family may sign the guest book and share memories of Leah at wwwfausettmortuary.com. To send flowers to the family of Leah Marshall Huff Jones, please visit our Heartfelt Sympathies Store. We encourage you to share any memorable photos or stories about Leah. All tributes placed on and purchased through this memorial website will remain on in perpetuity for future generations.